Did you know that the automotive aftermarket is a $36-billion industry? Original equipment manufacturers (OEMs), aftermarket auto parts manufacturers, car dealers, installers, retailers, and restoration specialists all want the best deals and hottest products for their stores, shops, warehouses, and garages. Where will they find what they're looking for? 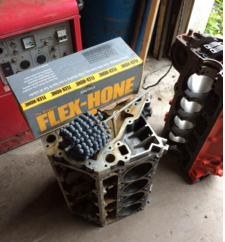 Flex-Hone® tools for engine cylinders don’t just impart an oil-retaining surface finish. They remove cut, torn, and folded metal that can interference with proper piston ring seating and sealing. What some automotive mechanics may not realize, however, is that ball hones can also help to prepare engine cylinders for new cylinder sleeves. By smoothing the sharp metal edges on cylinder walls, flexible honing removes burrs that could break off and interfere with proper cylinder-liner installation.